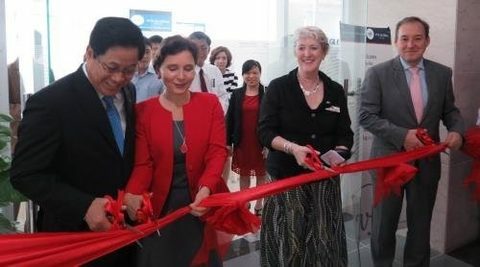 The new joint United Kingdom and Australia Visa Application Centre has been inaugurated in the central city to help those in central Viet Nam apply for UK and Australian visas. Representatives of UK and Australia Embassies join in an inauguration of the new joint United Kingdom and Australia Visa Application Centre in Da Nang. - Photo courtesy Da Nang visitor centre. Vice director of Da Nang’s Foreign Affairs Department, Le Thi Thu Hanh confirmed the news with Viet Nam News yesterday. The centre, which is located at ACB Tower, 218 Bach Dang Street, is open from Monday to Friday, and will also be open on Saturday mornings for those willing to pay an extra fee. Applicants in central Viet Nam no longer have to travel to either Ha Noi or HCM City to apply for visas. The British Deputy Head of Mission Stephen Lysaght hoped that the visa centre would encourage more visitors from central Viet Nam to come to the UK. The embassies will provide an option for online applications with introductions in Vietnamese to assist applicants with necessary documents. Russia and Laos have also opened their Consulate General in the city. Japan also plans to open a Consulate in Da Nang as a way of boosting tourism and exchange between Japan and the central city in the future.